Back in the day before computer social networking, people exchanged hand and typewritten letters and photographs with friends around the country. In the tattoo world, tattoo clubs became popular and were a way to connect with like-minded folks. 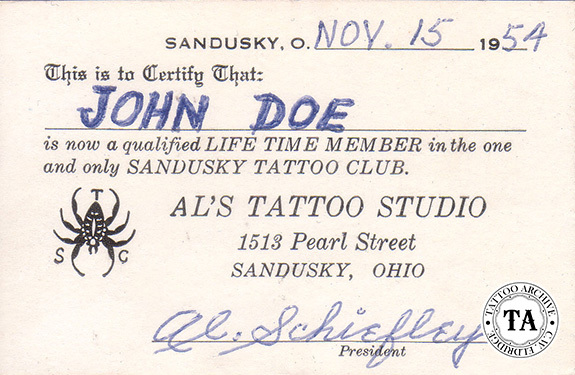 The idea of tattoo clubs goes back to at least the 1940s and perhaps earlier. Originally these clubs had informal social gatherings that often took place in pubs or restaurants and believe it or not grew into the convention scene we have today. Often these gatherings would be low-key events, more of a social than commercial affair. 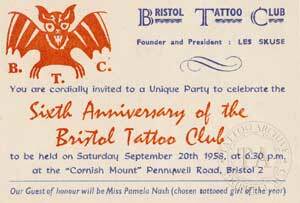 News articles about the Bristol Tattoo Club (BTC) in Bristol England inspired several of the American clubs that were formed in the 1950s. The BTC got a lot of press in England and those articles started appearing in American newspapers when Associated Press picked up the story of Les Skuse’s tattoo club. As interest grew, many of these clubs printed monthly or quarterly newsletters and mailed them to their members. These newsletters (much like the tattoo magazines of today) contained all sorts of current events happening in the tattoo world from pending legislations, up-coming conventions, opening of new shops and news in general about the tattoo world. Unlike the slick magazines of today these newsletters were very simple publications that were often created as a labor of love by active members. Although many of the early newsletters had no photographs they were full of what we see today as important historical information about tattooists and fans of that era. These were early efforts to spread the knowledge of tattooing and in a simple way, to make tattooing more acceptable to the masses. At one time most major countries of the world had at least one club and countries like England and the United States had enough interest to support several clubs. 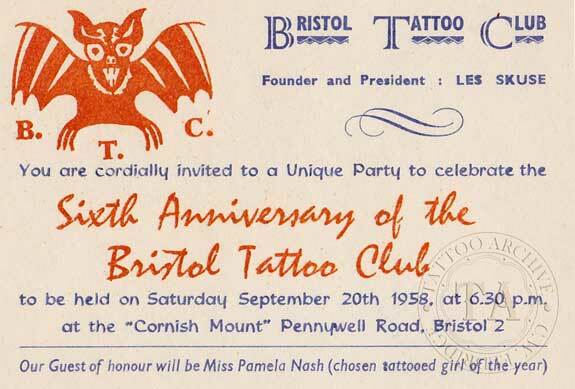 Sadly today, tattoo club conventions are a quaint part of tattoo history, with one exception. The National Tattoo Association (NTA) was founded in 1976 and held their 35th annual convention in Garden Grove, California in May 2014. Logos have an important role in any club and tattoo clubs were no different. Members in these clubs often had logos tattooed on them to show their affiliation.